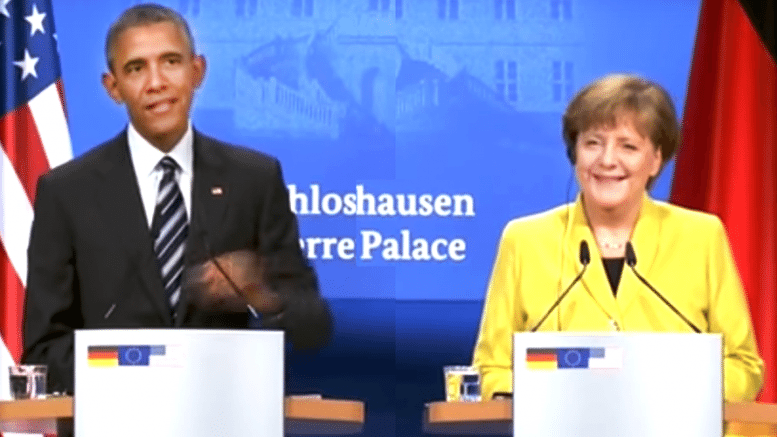 Hussein Obama took a few minutes to shore up his fellow globalist Angela Merkel in the face of the political pressure she so richly deserves. He calls her his “friend and partner Angela,” which is an accurate portrayal, particularly in the global Islamification and UN global government push. He’s been responsible for destroying North America, Merkel’s taken the lead in Europe as partners in crime. 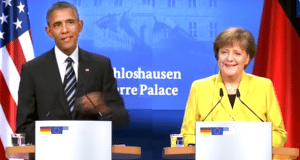 Obama says he’s valued Merkel’s thinking and perspective on a whole range of “global” issues throughout his “pretend presidency,” telling her directly “You have been a trusted partner.” There’s that “P” word again and it isn’t patriot. He would never consider himself one who puts the interest of the United States above “the planet.” He’s much too important for just one country, especially one he hates. He again refers to Merkel as his partner, his counterpart in destroying the old order and ushering in their New World Order. He added, “I value your judgment, I thank you for your commitment to our alliance and to our values and human rights for which we stand and I’m grateful for our personal friendship.” Nowhere was there the mention of what is best for the United States, that’s so passé and uncool. As Merkel looks on like a halfwit recovering from a beer stein to the temple, mouth open and drool at the ready, Obama says “I’m glad Angela’s still sticking around.” He seems somewhat surprised she hasn’t yet been drawn and quartered by the people of Germany, though the natives are becoming quite restless. Obama says he thinks the world benefits from her steady presence. That mole on his face is a steady presence too and we’ve got nothing to show for it. Pretending it’s sort of an afterthought that he would reinforce her anti-European caliphate creation positions that they’ve “partnered” on, Obama says, “By the way, what’s happening with respect to her position on refugees here, in Europe, she is on the right side of history on this.” Aside from the devastating destruction itself, that’s as strong of an argument as can possibly be made that Merkel is completely wrong for Germany and Europe. If Obama says it’s good, it’s bad. He claims a humanitarian concern as the humans of Europe watch their nations being destroyed by Merkel and Obama’s Islamic rabble. He claims it’s difficult to build walls, but walls are starting to go up in response to his destruction of national boundaries across the planet and it’s actually quite easy and effective. He hasn’t tried and he doesn’t want anyone else to, the motivation behind his false claims. Like they care what he thinks. Shut up Obama, the only one that wants to hear your voice is you and nobody cares to hear your scripted lies.